ElliptiGO Inc. today announced its sponsorship of the REI Outessa Summit, outdoor weekend getaways for women which offer authentic outdoor adventures led by professional athletes and guides. In its inaugural year, the two weekends will be held at Kirkwood Resort near Lake Tahoe, California, from August 19 to 21, and Powder Mountain near Salt Lake City, Utah from September 9 to 11. Registration opens to the public today. As part of the partnership, ElliptiGO will provide outdoor elliptical bicycles for attendees to ride during guided adventure tours at scenic Outessa locations. Combining the best of running, cycling and the elliptical trainer, ElliptiGO bikes provide a fun, cardiovascular workout alternative that eliminates impact on joints and allows people to get out of the gym and enjoy the outdoors. ElliptiGO will have available a selection of its original long-stride elliptical bikes and its newest model, the Arc. These weekends boast flexibility and variety since each attendee can customize her schedule, although choosing classes might be the biggest challenge as more than 200 options exist. Camping, backpacking, kayaking, outdoor cooking, mountain biking, paddle boarding, rock climbing, yoga, hiking and trail running are some of the offered activities. ElliptiGO rider, Hollywood stunt actress and “American Ninja Warrior” contestant, Jessie Graff, will be on hand to ride with Outessa women at both the Kirkwood and Powder Mountain locations. Graff is an impressive athlete who uses elliptical cycling to maintain the cardiovascular fitness required by her grueling career. 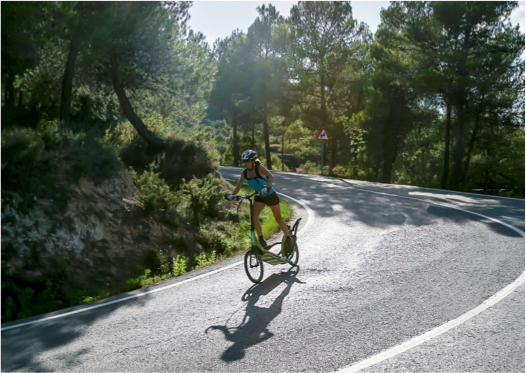 Having ridden an ElliptiGO bike since 2014, including participation in the 2014 Elliptical Cycling World Championships, Graff is excited to lead participating women on an adventure tour of the area. To learn more and register, visit www.outessa.com, follow on Instagram and Twitter, and like on Facebook.